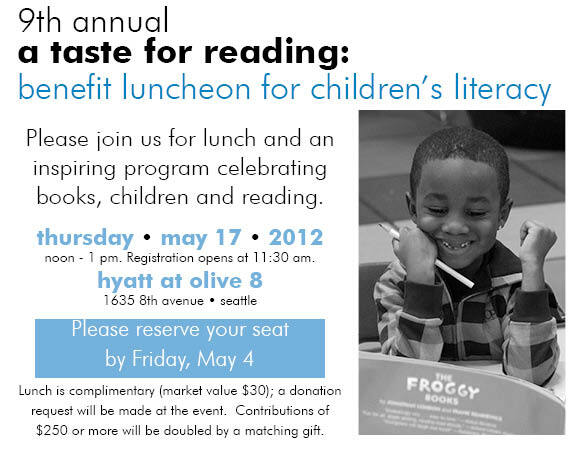 Page Ahead invites you to our 15th annual A Taste for Reading benefit luncheon. 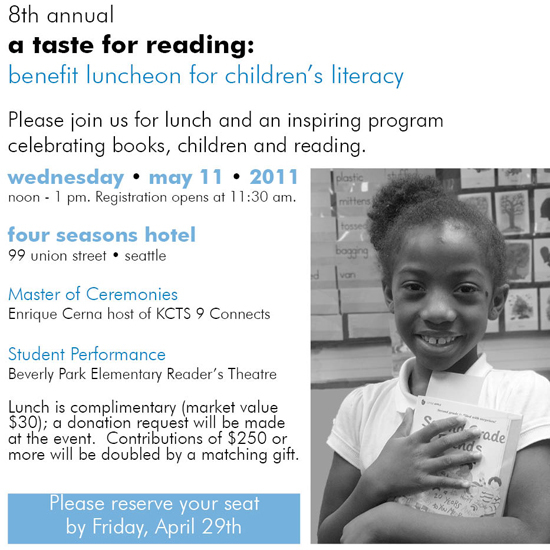 Please join us for an inspiring program celebrating books, children and reading at Motif Hotel, Downtown Seattle. Doors open at 11:30AM, benefit concludes at 1:00PM. 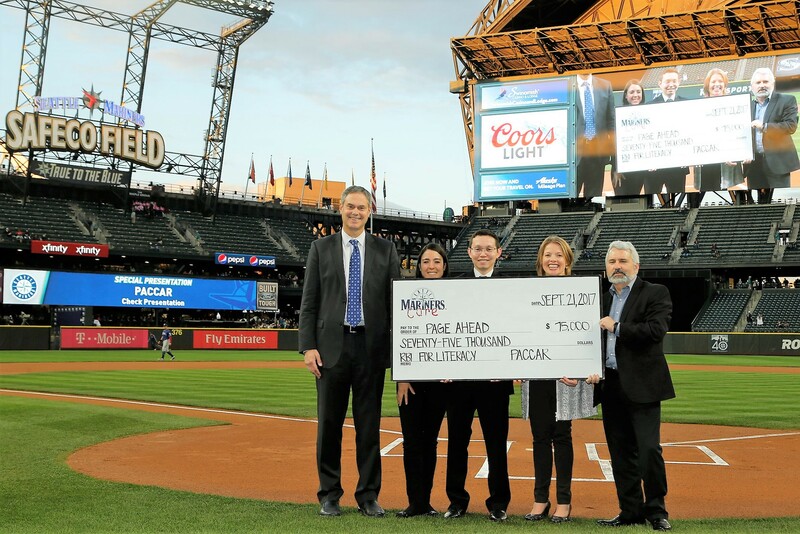 PACCAR donates $75,000 to Page Ahead Children's Literacy Program through the RBI for Literacy program – PACCAR has teamed up with the Seattle Mariners and together, they are creating thousands of reading opportunities for kids in need. PACCAR believes that with a strong education, people have a life full of opportunities. We couldn’t agree more! Mariners host Book Drive Aug 15th! During this giving season we are delighted our friends at University Book Store, Elliot Bay Book Company and Barnes & Noble Seattle, have chosen to put new books in the hands of kids who need them. University Book Stores, Elliot Bay Book Co and Barnes & Noble Seattle will be collecting new books and monetary donations for Page Ahead. Stop by to complete your holiday shopping and support their efforts to give kids in need the chance to read! On August 25th 2016 at Century Link Field, Page Ahead was among the 12 outstanding Pacific Northwest charaties recognized by the Seattle Seahawks and Bonneville Seattle for their work in the community for 2015 - 2016. Barnes & Noble Pacific Place hosts in-store Bookfair to benefit Page Ahead, Saturday, September 10th - 16th. Mention Page Ahead at check out and a portion of your purchase will go towards helping kids in need have access to new books. Mariners host Book Drive Aug 23rd! Join PACCAR and Mariners Care by bringing NEW children’s books or cash donations to the Tuesday, August 23rd game against New York. It's that time of year again, time to give books to kids in need for summer reading. Our Book Up Summer program gives young students the tools and incentive they need to read during summer vacation. Grounded in current literacy research, this evidence-based reading program is offered to high-poverty elementary schools through Page Ahead’s partnerships with school districts across Washington State. View the map here. Each student receives their choice of 12 new books that are theirs to keep and read over summer vacation and beyond. From 04/26 - 6/15 elementary students in grades K - 2nd, will be selecting their new books. That's 61 schools, over 9,000 kids receiving over 100,000 new books! Leading Provider of Children’s Books and Literacy Programs in Washington State is Recipient of National Grant Courtesy of GreaterGood.org and Capstone Community Fund. The program received an estimated 3,600 books, valued at approximately $19,500. Over the next few months, the program will distribute these pallets as a part of its annual donation of more than 60,000 new books to children, families, and communities in need. During this giving season we are delighted our friends at Barnes & Noble and University Book Store have chosen to put new books in the hands of kids who need them. University Book Stores and select Barnes & Noble locations will be collecting new books for Page Ahead. Stop by to complete your holiday shopping and support their efforts to give kids in need the chance to read! Bonneville Seattle and the Seattle Seahawks have selected Page Ahead as their Charity of the Month for September 2015! Mariners host Book Drive Aug 25th! Join Mariners Care and PACCAR by bringing NEW children’s books or cash donations to the Tuesday, August 25th game against Oakland. Congratulations to our Book Up Summer graduates! As we say a fond farewell to the second graders, who are now fully stocked with books, we welcome a new wave of Kindergarteners! This past spring our new little readers have been excitedly selecting their first 12 books to take home and read throughout the summer. The results are exciting – kids who participated in our Book Up Summer program are showing test scores anywhere from 5% to 10% higher on the standardized reading tests than the previous group of kids not in the program. We look forward to seeing our new friends for Book Up Summer 2016! 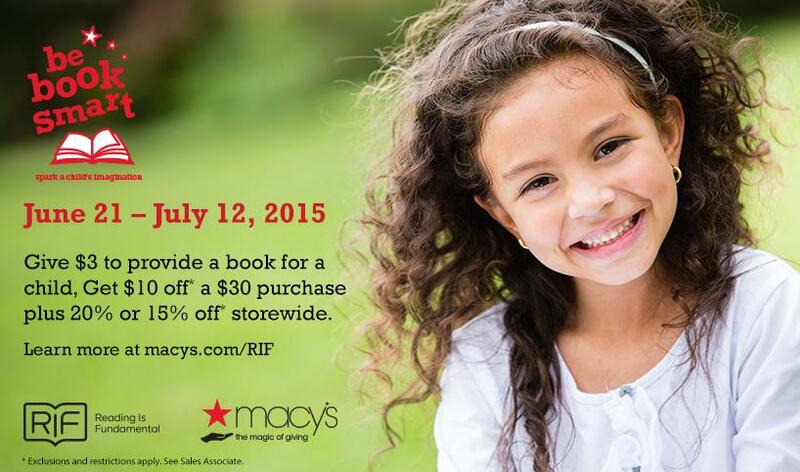 Page Ahead, Reading Is Fundamental (RIF), and Macy’s have teamed up to Be Book Smart this summer and help get books to kids in need. Be a part of the action! Help Page Ahead bring the joy of reading to more children this summer! Visit your local Macy’s store or go to: Macy's/RIF to learn how you can get involved and help Be Book Smart! Whew! We just wrapped up Book Up Summer for this year. And what a year it was! We held more than 50 book fairs this year! 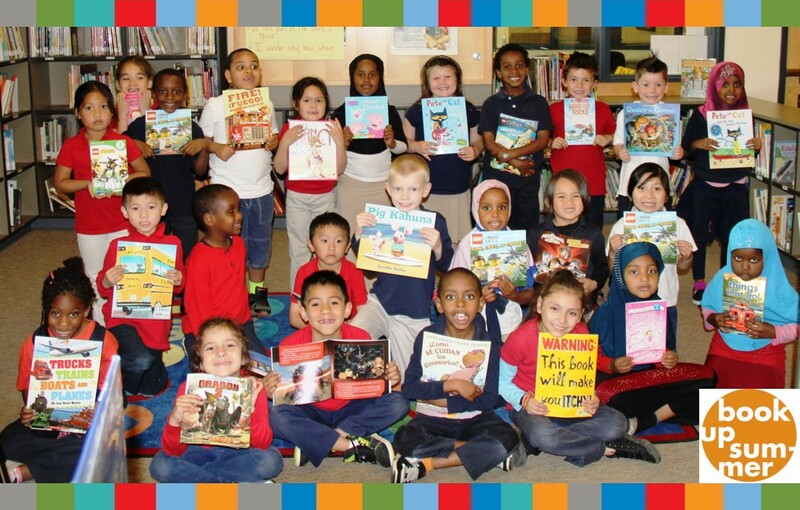 We gave 58,656 new books to 4,888 kids at 38 schools in 11 school districts in 7 counties! 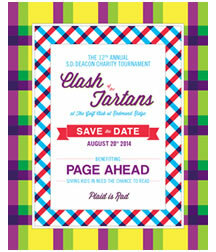 Join Page Ahead and host SD Deacon for an afternoon of golf and fun for children’s literacy. This year’s tournament will be held on Wednesday, August 20th at the Golf Club at Redmond Ridge. Shotgun start is at 1:30p with a celebratory dinner to follow. Seattle Mariner's left fielder Raul Ibanez has been selected as the nominee for MLB's Roberto Clemente Award. And he's chosen to help Page Ahead with his award. Read more here. Book Up Summer is on the Radio! On the final day of the 2012 school year, Page Ahead gave 20,000 new books to kindergarteners and first graders throughout Seattle and Highline schools districts. By partnering with School’s Out Washington and Scholastic, and with a generous gift from Target, Page Ahead provided these mini-libraries to nearly 1,700 young readers. The group was diverse as well as large, but from urban neighborhoods in Seattle, to rural towns in Yakima Valley, to immigrant communities in Burien, participating students had one thing in common: their families were less likely to have books at home than were high-income households elsewhere. Page Ahead developed the BOOK UP SUMMER! program informed by recent research. Studies indicate that differences in children’s resources at home corresponds to achievement gaps at school and, moreover, that the gap widens in summer months outside the classroom. By providing students with their very own books, Page Ahead secured crucial literacy tools for students whose access to reading material might otherwise terminate with the school year. 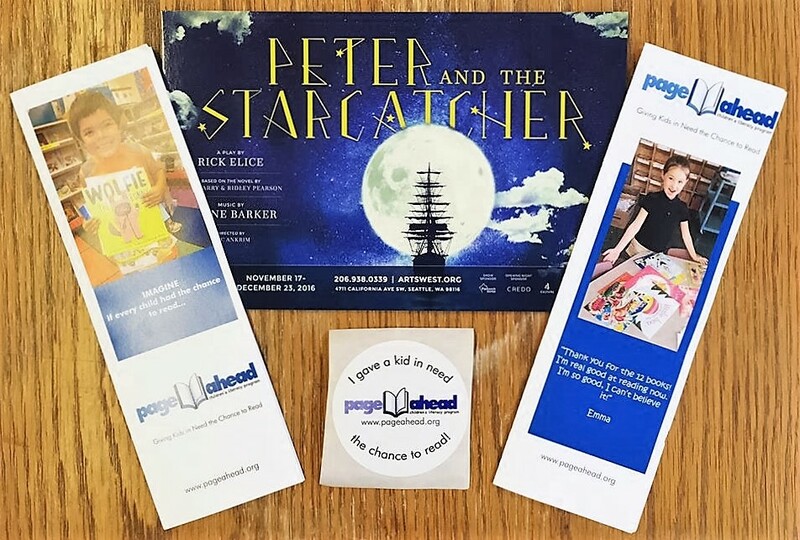 Page Ahead expressed its appreciation of families’ role in children’s literacy by including another surprise with the new books a voucher for two free tickets to a Mariners game! Over 200 students and families participated, and two lucky students joined Page Ahead’s Executive Director Susan Dibble on the field and the Jumbotron! The books given away this summer will help students keep up their reading skills during the summer, and return to school in the fall ready to learn. On Saturday, June 23rd the Downtown Bellevue Barnes & Noble will donate a percentage of all purchases to Page Ahead! Stop by to support Page Ahead! True crime writer Ann Rule and her daughter Leslie Rule speak and sign their books at 2:00 pm. Can't attend our bookfair at Barnes & Noble? Go to BN.com and support us online from 6/22/12 to 6/28/12 by entering book fair ID 10798569 at check out! The Best Books for Kids awards celebrate the talent of the authors and illustrators without whom Page Ahead could not fulfill its mission of giving quality new books to children in need. We hope the Best Books for Kids Awards will serve as a guide to teachers, librarians and parents in making quality literature accessible to children. Our judges for this year's awards are experts in children's literature, drawn fro across Washington State: Rene Kirkpatrick of Third Place Books, Seattle; Cecilia McGowan, children's services coordinator of King County Library System; Marilyn Carpenter, professor of literacy, Eastern Washington University and author of The Children's Book Compass Blog; and Stefanie Malone, community outreach manager at KCTS television, Seattle. Independent bookstores across Washington State have joined together to give kids in need the chance to read. Visit a bookstore near you and give a book to a child in need now through June 8th. Find the independent book store closest to you and give a kid in need the chance to read! Plan on rallying your friends and supporting your favorite charity (us!) as part of one of the biggest days of giving in King County history. Then click on our GiveBIG button to make a donation on June 23rd. 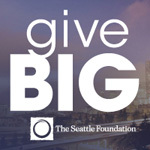 To learn more please visit The Seattle Foundation GiveBIG page. We are proud to announce that Page Ahead has been honored at the state level by the Washington Organization for Reading Development. In September 2010, Page Ahead received the Celebrate Literacy Award for exemplary accomplishment in the promotion of literacy at the annual WORD conference in Seattle. This award recognizes organizations, institutions, and individuals who have made significant literacy contributions at the state level. To be nominated for the statewide award, an organization must be a past recipient of a local WORD council's Celebrate Literacy Award. Page Ahead received the Celebrate Literacy Award from the Seattle WORD Council in September 2009. We thank the members of WORD for this recognition, as well as the many partners and volunteers who make our efforts possible. Thank you! After 20 years of providing great new children’s books to the kids who need them, we felt it was high time to recognize the “best of the best” in children’s literature. So we created the Best Books for Kids award in celebration of our milestone anniversary to recognize the wonderful creativity available in children’s literature today. We announced the winners of the Best Books for Kids Awards at the Library Bistro in downtown Seattle. The Puget Sound Council nominated the book finalists, and the winning books were chosen by a panel of children’s literature experts from across Washington State. Special thanks to our judges: Stephanie Dunnewind, Children’s book reviewer to The Seattle Times; Cecelia Goodnow, Cover to Cover Kids blog; Rene Kirkpatrick, Third Place Books; Cecilia McGowan, Children’s Services Coordinator of King County Library System; and Danielle Ringwald, of Get Lit! in Spokane. Read Aloud: Duck! Rabbit! by Amy Krouse Rosenthal; Maybe a Bear Ate It! by Robie Harris; and The Three Little Tamales by Eric A. Kimmel. Although not chosen to receive an award, the judges gave A Book by Mordicai Gerstein special mention for its originality. Non-fiction: Butterflies and Moths by Nic Bishop; The Boy Who Invented TV: The Story of Philo Farnsworth by Kathleen Krull; The Story of Snow: The Science of Winter's Wonder by Mark Cassino;and Boy, Were We Wrong About the Solar System! by Kathleen V. Kudlinski. Multicultural: One Hen - How One Small Loan Made a Big Difference by Katie Smith Milway; The Beckoning Cat by Koko Nishizuka; Our Children Can Soar by Michelle Cook; and Book Fiesta! by Pat Mora. And remember, nominated books make excellent gifts! Just click on the links next to the titles above to start your shopping; a portion of each purchase will go to Page Ahead. Thank you! Need book donation ideas? Check out our wish list. Thank you for the books you gave me. We all love how you let our school have some of your books. You are so awesome for giving us these books. You are changing kids lives by doing this. Page Ahead Children’s Literacy Program is proud to partner with independent booksellers in celebration of National Children’s Book Week, May 10th to 16th and collect hundreds of new books for kids like Emmy. Whether you want to donate a new copy of your old favorite or a new-fangled graphic novel the kids seem to love, this is your opportunity to put a brand new book in the hands of a child, perhaps one who has never possessed her very own book! Purchase a book for a child in need at one of the independent bookstores below during National Children’s Book Week. Some stores will offer 20% off books purchased to donate. Check back here or visit our Facebook page for an up-to-date list of participating indies. 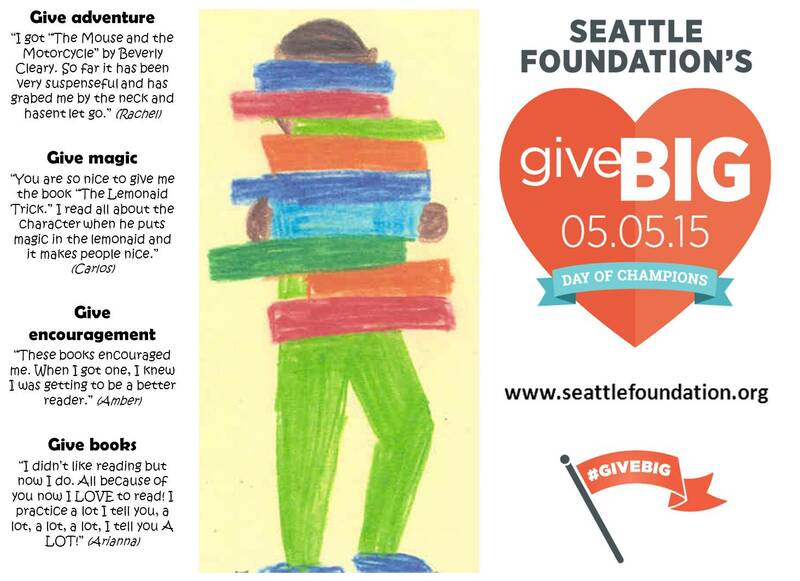 Page Ahead’s book drive to celebrate National Children’s Book Week is sponsored by Scholastic Inc and Seattle Weekly. Thank you to you “awesome” people who are helping change kids’ – like Emmy’s – lives. Page Ahead appreciates all the sponsors, guests, table captains, volunteers and students who helped to make our 7th Annual Taste for Reading benefit luncheon a success! Together, we surpassed our goal of $90,000 to provide new books and literacy services for children in need. 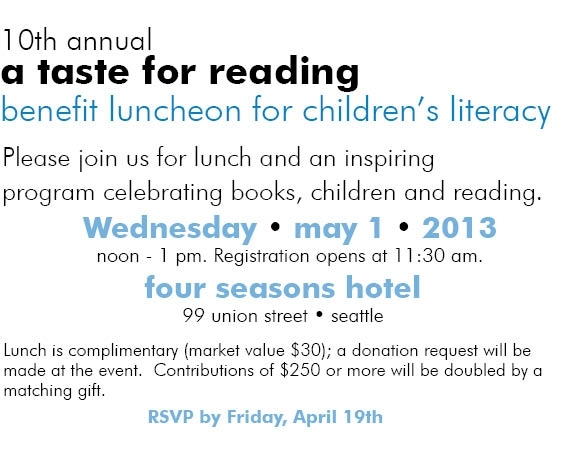 Our 2010 luncheon represents a special anniversary for Page Ahead – we have been giving away books in Washington State for 20 years! We were excited to recognize founding board members, Dave Osmer, Barbara Clark and Rick White who were in attendance. First grade students from Daniel Elementary students delighted guests with their performance of The Three Tamales, one of Page Ahead’s award-nominated books. They were followed by more than two dozen second and third graders from Van Asselt caught the spirit of the day perfectly with their “Thank You!” song. Special thanks to emcee Enrique Cerna, the host of KCTS9 Connects, Instructional Coach Lien Le from Daniel Elementary and Paul Fowler, choir director at Van Asselt Elementary. Thank you to 49 Spokane area banking institutions for making Banking for Books 2010 a huge success! They encouraged their patrons to "Make a Book Deposit" and collected more than 1,100 new books for local kids in need. Shout out to the branch that collected the most new books - an amazing 453 - Spokane Federal Credit Union! In celebration of their accomplishment, breakfast is being provided for the employees of their branch on May 5. Thanks to Albertson's on N Indian Trail, Albertson's on NW Blvd, Costco, Craven's Coffee, Jan Young, Rosauers, Starbucks Coffee on Main & Post, Yoke's Fresh Market for making it possible. What do 2,000,000 books weigh? More than 40 elephants! 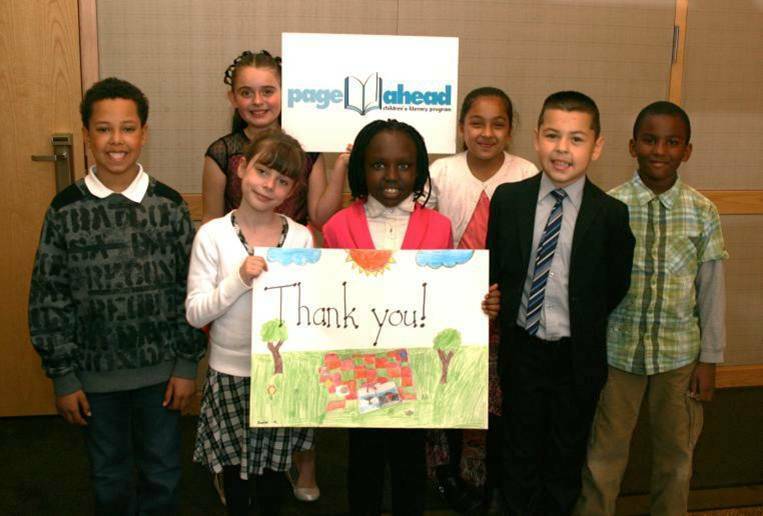 Washington Governor Christine Gregoire declared March 12th, 2010, to be officially “Page Ahead Day.” On this day Page Ahead gave away our 2 Millionth book at Van Asselt Elementary School in Seattle. The celebration included music, entertainment, cake, and of course, new books! Everyone enjoyed a lively rendition of The True Story of the Three Little Pigs, read by Washington State First Gentleman Mike Gregoire. Radio Disney entertained the kids, and many volunteers--including VoluntEars from the local Disney Store--were there to read with the children. Check out the special “Thank You” song composed and performed by the Van Asselt Choir in commemoration of the occasion. Special thanks to sponsors The Boeing Company, MoneyTree, AKJ Books, and Scholastic Books, along with all who celebrated with us! Page Ahead has been named Program of the Month for March by Reading Is Fundamental (RIF)! Founded in 1966, RIF is the oldest and largest children’s literacy organization in the country. Thank you RIF! Eight students from Audubon Elementary had the opportunity to attend the U.S. Figure Skating Championships in Spokane on January 24. Page Ahead donated ten tickets to the school for the event. A special treat was the chance to meet gold medalist Rachael Flatt, who serves as a spokesperson for the national group Reading Is Fundamental (RIF). 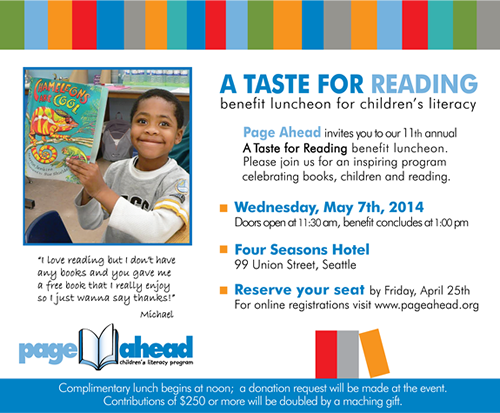 A Taste for Reading, Page Ahead’s annual fundraising luncheon has already exceed the fundraising goal of $60,000! The event featured young authors from Rainier View Elementary in South Seattle who shared the words they created for their school’s Young Authors Conference later in the spring. Also featured, was seven year old Byrne, who shared his experience of hosting a book drive for his birthday with the 250 guests. Special thanks to our sponsors, The Boeing Company, the ChenSteinO'MalleySven Foundation and Washington's Lottery, who matched each donation of $250 or more! Ballet Spokane and interPLAYERS presented "Tales of Beatrix Potter," on Sunday, March 25th. Theatre patrons who brought a NEW children's book to donate received $1 off admission! All books collected at the event benefited Page Ahead, and will be distributed to children in Spokane and across the state. The Seattle Chapter of the Pi Beta Phi Alumnae and the University of Washington Collegiate Chapter hosted their Second Annual Walk for Literacy at Green Lake. Walkers braved the wind and rain, and collected 165 new children's books and $425! Coffee and refreshments were donated by Starbucks and QFC, walkers got to hang out with Clifford the Big Red Dog, Curious George and the Cat in the Hat! Interested in hosting your own fundraiser to benefit Page Ahead? Contact LeAnne, Community Outreach Coordinator. Participating restaurants across Washington State donated at least 10% of their proceeds on August 3rd to support children's literacy. Clifford the Big Red Dog and Curious George visit diners in some neighborhood restaurants, and some local bookstores collected new children's books to help support the event. Together, restaurants, bookstores and their patrons provided over 3,500 new books to be distributed across Washington State. Additionally, all those who visited a partcipating restaurant on August 3rd were eligible to enter a drawing to win a week-long travel package for four, including round-trip airfare, courtesy of Alaska Airlines, and accomodations. Congratulations to Rebecca Sellers of Seattle for winning the prize package by entering at Tutta Bella in Wallingford. To learn more about Dish Up Literacy, visit www.DishUpLiteracy.org or send us an email to learn how to participate next year. The 6th Annual Overlake School’s Benefit Concert raised over $2,600 to provide books for at-risk children. Since 2001, students at The Overlake School have planned, produced and performed in a concert to raise funds for a local charity. Page Ahead was the 2006 beneficiary. The Cascade Shakespeare Players wowed guests at the 3rd Annual A Taste for Reading Benefit Luncheon with their rendition of Romeo and Juliet. The guests exceeded expectations and have contributed over $53,000 to date. All gifts were matched, doubling the number of new books Page Ahead is able to distribute to Washington's kids in need. Thank you to our sponsors: The Boeing Company, Expedia Inc., The Seattle Times, The Triple Door, Parametrix Inc., nikkomedia, DeLaurenti Food & Wine and Macy’s. Read the press release [PDF]. The UW and UPS Chapters of Pi Beta Phi and the Pi Beta Phi Alumnae Clubs of Bellevue, North Puget, Seattle, and Tacoma Walked for Literacy around Green Lake. Participants met at 9a and collected over $350 and 145 new children’s books to benefit Page Ahead. Download the poster here [PDF]. For more information, contact LeAnne, Community Outreach Coordinator. Page Ahead, Ballet Spokane, and interPLAYERS presented Ballet for Books: A Wonderland Miscellany to benefit children's literacy in Spokane. Patrons enjoyed a special performance of Alice in Wonderland by Ballet Spokane, Spokane's only professional ballet company, and donated $600 and almost 200 new children's books. After the show, patrons were invited to attend a Mad Hatter's tea party at the theatre. Special thanks to Ballet Spokane, interPLAYERS for donating the space, and Rocket Bakery for sponsoring the tea party. Fantastic items including lunch at various Downtown Seattle restaurants, a membership to a local museum, and lift tickets to Snoqualmie were auctioned off at the Not-So-Silent Auction at the Cascade People Center. Over $800 was collected to benefit Page Ahead Children’s Literacy Program and the Washington Reading Corps. The Yale University Whiffenpoofs of 2004 Live In Concert!